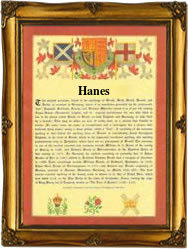 This is a variant of the interesting name Haines which has two possible origins. The first being a locational name from a place in Bedfordshire called Haynes, recorded as Hagenes in the Domesday Book of 1086 and as Hawenes in the 1202 Assize Court Rolls of that county. The name has been explained 'Hagona's headland', or as haga-naess i.e. 'land on which stood a hawthorn (tree)'. The second possibility is that the name is an English patronymic i.e. 'son of Hain' - a personal name derived from the Germanic name Hagano (meaning 'hawthorn') and recorded as Hagana in the Domesday Book of 1066. Two early recordings of marriages in London are between one, Ann Hanes and Daniell Kingston in 1654 at St. Michael Queenhithe, and on Bridget Hanes and Henry Stafen on September 9th 1675 at Temple, Church of England Church. The first recorded spelling of the family name is shown to be that of Peter Hain, which was dated circa 1200, The Pipe Rolls of Dover, during the reign of King John "Lackland", 1199 - 1216. Surnames became necessary when governments introduced personal taxation. In England this was known as Poll Tax. Throughout the centuries, surnames in every country have continued to "develop" often leading to astonishing variants of the original spelling.